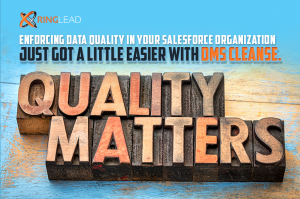 MELVILLE, NEW YORK, July 18, 2017 (Newswire.com) – RingLead Inc., an industry-leading SaaS data management provider, today released a task scheduler in its premier data deduplication tool, DMS Cleanse. Within DMS, users can now configure multiple deduplication tasks to run hourly, daily, weekly or monthly, based on a business’ unique data management needs. Over 55 custom logic matching rules, custom master record selection, and custom field level selection make it possible for users to automate deduplication tasks with confidence and a level of unparalleled accuracy. The scheduler is now available to all existing DMS Cleanse users via an automatic cloud update and is available for all future purchases of DMS Cleanse at no additional cost to users. DMS Scheduler allows users to leverage preset deduplication matching templates, or configure completely unique templates to satisfy their organization’s needs. To keep task owners informed on all DMS Scheduler activity, DMS sends out an email notification every time a task has been successfully executed. Once a task is complete, a user may choose to review the duplicates and defer the merges to a later time, or review and merge duplicates all at once. In-depth overviews of task results are available within DMS in a convenient “Reports” section. Within this section, users can view everything from task execution frequency and the number of records analyzed in a task, to the number of duplicates found, and the number of duplicates merged as a result of a task. Tasks can be disabled at any point by simply logging into the solution.